EditPad Pro 7.2.3 free download. No worries about Windows, Unix/Linux, Mac or mixed line break styles. Convert UPPER, lower, Title and iNVERTED case. Versatile block and clipboard functions and options for moving and copying blocks of text. Clip collection to store and instantly reuse text snippets and templates. Unlimited undo and redo save your day. Compare two versions of one document (diff). Easily work with many files using the tabbed layout instead of traditional overlapping windows. Make your text editor work the way you want, rather than the other way around. Edit every kind of text file. The difference between this free evaluation version and the full version is that the evaluation version will remind you to purchase your personal license key if you wish to continue using EditPad Pro. All of EditPad Pro's features are available in the evaluation version, except for the spell checker (to reduce the download size of the evaluation version) and the configurable print headers (the headers in the trial version are fixed, reminding you to purchase EditPad Pro). While you can use the custom syntax coloring schemes you can download with the trial version, the separate application for creating your own coloring schemes is not included. The free evaluation version comes with complete documentation, including a printable manual in PDF format. If you want, you can read the EditPad Pro manual without downloading and installing the trial version. EditPad Lite application is a convenient, carefully designed text editor and Notepad replacement. EditPad Pro has a lot of functionality that makes editing text files more convenient for you. 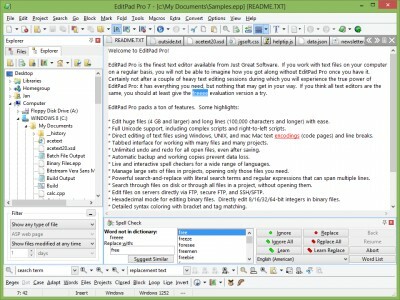 Editor software represents a fast and feature-filled multiple document text editor. AB-Edit is the comfortable text editor for work with multiple documents.